"laughter is timeless. imagination has no age, and dreams are forever." Visitors recount their Disney World experience as enchanting and extraordinary. After travelling there for the first time during Thanksgiving break, I have to agree; the trip was absolutely wonderful. Through my school's music department, I had the incredible opportunity to journey to Florida with my peers and sing in two performances of Disney's Candlelight Processional, an hour-long, Christmas choral showcase in Epcot featuring high school choral groups, the park's own Voices of Liberty, a skilled orchestra and conductor, and a celebrity narrator. Some time before the trip, my peers and I received a packet of fourteen Christmas songs to learn for the processional. With most of the songs in harmony, including three pieces in different languages, and just three group practices to prepare, finding time to practice and memorize the songs proved challenging. In the week before the trip, aided by the break beginning that Wednesday, I dedicated more time to music practice than I had since I obtained the music. That Friday night following our final rehearsal, I excitedly packed my bags. And at 2:00AM, eagerness overcoming lack of sleep, I boarded a bus in my school parking lot that would deliver my classmates and I to an airport in Baltimore. At around 5 AM, we flew to Orlando, Florida. I tried to sleep, but couldn't resist admiring the view first. We arrived at Disney's All Star Music Resort, our home for the next five days, and ventured to Hollywood Studios in small groups for our first park day. Despite running on perhaps four hours of sleep, the allure of Disney kept us alert and patient. Today, waiting 50 minutes for an attraction seemed long, but we learned later that this time is a short wait. On the upside, I have to appreciate some of these lines: they allowed me to get to know my peers better. At Hollywood Studios, we attended a variety of shows: Indiana Jones, Beauty and the Beast, the Muppets, the Little Mermaid, and even a Frozen Sing-a-long (attempting to belt notes from "Let it Go" amused my alto voice). I learned that Disney's nighttime offerings, though, are what make the park dazzling. Bright lights illuminated the colorful streets while vibrant projections danced across the Hollywood Tower of Terror. Fake snow, from somewhere, showered us as neon lights glimmered, rainbow, on palmetto trees and buildings. Every park possesses its own unique nighttime show, right before closing. At Hollywood Studios, this show is Fantasmic. My words and pictures cannot accurately depict how beautiful and creative the performance was. Disney villains, merged into a great threat against Mickey Mouse, were projected onto water, spraying upright to face the audience. An immense dragon, multiple explosions, and cameos from favorite princesses constitute only a few of the many jaw-droppers this show displayed. To my naive surprise, Epcot, was, in fact, not a golf-themed park. Although the giant globular object may appear to be a golf ball from afar (maybe it actually is a golf ball, I don't know), the park actually hosts small towns from various countries around the world. My friends and I voyaged through France, China, Japan, Norway, America, and Britain in a matter of hours, watching shows and admiring structures, a few footsteps quickly transitioning us to new worlds. We ate in Morocco, and that meal was easily the most substantial dish I had throughout the trip. Around 4PM, Disney officials ushered us into an entrance in Italy. I was beyond thrilled to be walking through a "secret entrance", but attempted to retain a calm composure. That composure faltered when, following acquiring a golden robe for the performance, I jumped around in excitement and attempted to take many pictures before the brief rehearsal began. 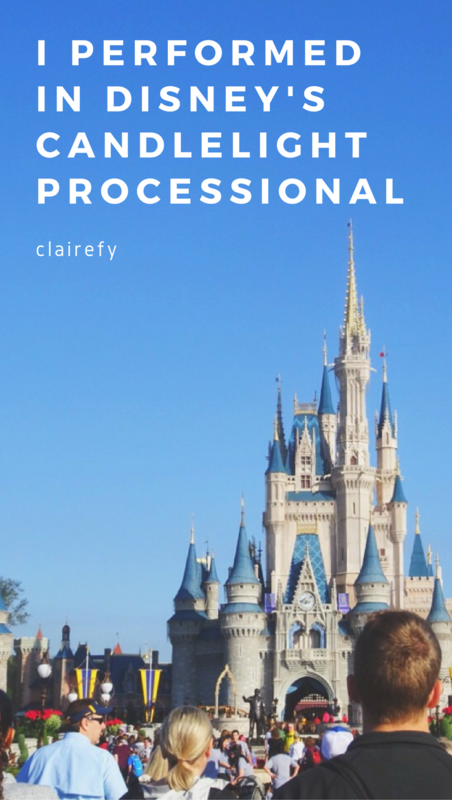 Equipped with maybe forty minutes of rehearsal, a flickering candle, and enough anticipation to last me a lifetime, we strode in long lines of gold through Epcot for our first performance. We sang "God Rest Ye Merry Gentleman" and other tunes as we approached the stage and audience members waved and recorded us on phones. On stage facing the audience was the first time I grasped how tremendous this event was. Laurie Hernandez, an award-winning Olympian gymnast, stood just feet from me, in front of skilled performers inside a Christmas tree, narrating to an expectant audience that stretched beyond the bleachers and into the "country" behind. So I sang, louder, more attentive, more musical, and more conscious of the harmony enveloping me, harmony created by hardworking performers and other high school students, than I have before. And it was great fun. I was most looking forward to this park to see the castle, and the scenery did not disappoint. Walking up to the castle seemed surreal, the epitome of a dream, realized. Even the most minute details of Magic Kingdom grabbed my attention and contributed to this grand utopia. 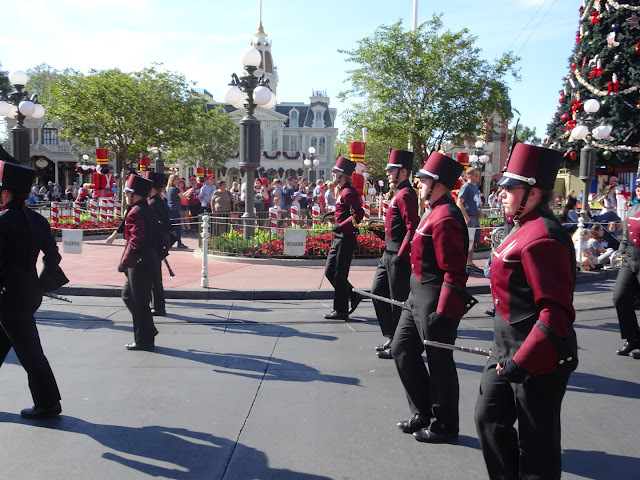 Early in the afternoon, my school's band marched through Main Street. Later, a venture to Splash Mountain, a water ride ending with a drop and a soaking classmate, convinced me to try all roller coasters possible despite initial hesitance. My friends and I must have ventured to Space Mountain, a dark indoor roller coaster with light-up tunnels and a drop seemingly into the stars within Tomorrowland, at least four times, first waiting through the day and again and again during the night as many left seeking spots for the nighttime show. Again, the attractions, somehow more effervescent in the nighttime, exceeded expectations. Lights adorning buildings gleamed; glow-in-the-dark handhelds shone from excited hands; fireworks framed the picturesque castle, glowing blue in the dark. After we had enjoyed some found time the night before and that day while members of the school orchestra performed at Disney Springs, the universe rewarded us further. A kind stranger gifted us fast passes to Flight of Passage, an Avatar-based virtual reality attraction in Animal Kingdom boasting a three-hour wait. Thanks to his generosity, we experienced an adventure, somehow zooming through trees on the back of a creature while in reality remaining stationary on bikes. Of course, more roller coasters followed, including a Mount Everest ride we tackled at least five times. That night, the show Rivers of Light highlighted different creatures in the Animal Kingdom with glowing flowers and animals that brightened the dark waters. The final day at Epcot was bittersweet. The previous night, I copied biology notes from a considerate classmate in the dark, and I knew I needed to return to my classes and healthy food. Although I had eaten some overpriced bananas for several breakfasts and a dinner, I was eager for rice, vegetables, and fresh fruit. Still, I was saddened to leave the magic behind and spend less time with my peers. We finished our tour with a trip to Soarin', an attraction where mock airplane seats lift viewers up to a giant screen and fly through different world landmarks, and another meal at the Moroccan restaurant. We boarded another three buses and a plane, finally returning home just past midnight and waking hours later to attend school the next day. Despite my worry for keeping up with classes while on the trip, I now believe this experience was worth every minute. I had the opportunity to create music and explore worlds with friends, some old and some new. While I don't know if I will ever be able to visit Disney World again, I know I will remember this experience as truly magical. Thanks Anna! I hope you have the chance to visit Epcot, and I'm glad you've seen Disneyland before! It truly was, Emily, thanks for reading! What a wonderful experience! But the highlight must have been your performance. I'm sure you'll remember that for the rest of your life! I've only been to Disney once, for an afternoon. (We were passing through Florida, driving cross-country, and couldn't spare more time.) I hadn't realized there was so much to see. Maybe I should think about going back sometime. I hope you have the opportunity to! I thoroughly enjoyed performing there. I agree, it was an incredible opportunity. Thanks Kimberly! Thanks Laura! There really is no other experience that parallels becoming part of one sound in a chorus. Thank you Dani! I really enjoyed the concept of being able to walk into a different atmosphere at Epcot. Thank you Taysa, I hope you have the opportunity to visit sometime! This is beautiful Claire! I am super happy that you had a great time :) I've been to Disney in the US, but I can't remember which one. The photos you took are beautiful and I am proud that you got to perform there. I could only wish I could visit Disney as well, it is so beautiful there! Thanks Jillian! I look forward to seeing more of your writing in the coming year as well!